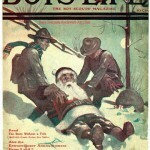 In 1912, an 18-year-old art student named Norman Rockwell walked into the offices of Boy’s Life Magazine looking for work. 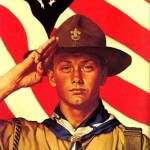 When he left, he had his first commission to do a magazine illustration and had begun a relationship with the Boy Scouts of America that would last for more than 60 years. 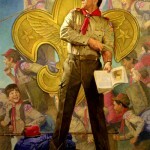 Rockwell became the visual spokesman for Scouting, bringing its spirit and ideals to life through hundreds of now-classic paintings. 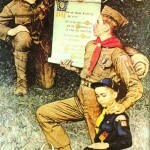 Every year but two from 1925 through 1976, Norman Rockwell did a painting for the annual Boy Scout calendar published by Brown & Bigelow. 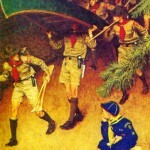 Each painting presented an image of idealized Scouts in worthy action, and always with meticulously accurate uniforms and equipment. 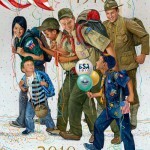 By 1929, the Boy Scout calendar was the most popular in America, and it remained so for many years. 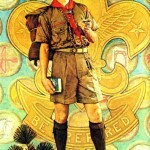 In the sixties, Rockwell’s focus broadened to include many more minority and foreign Scouts. 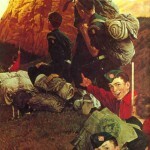 His calendar paintings for the world jamboree years of 1963 and 1967 both depicted Scouts of various nations joyously united. 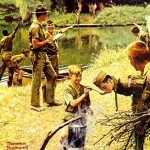 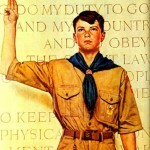 Rockwell’s illustrations almost defined America in the middle part of the 20th century; they certainly helped define Scouting. 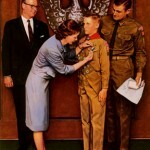 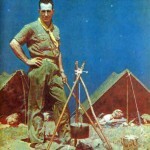 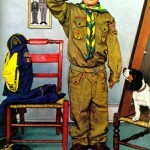 His career spanned nearly the whole history of the Boy Scouts to date, encompassing an age during which both America and the Boy Scouts grew immensely, a period, as Rockwell wrote, “when America believed in itself. 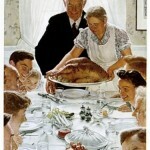 I was happy to be painting it.” The artist died in 1978 at the age of 84.